See story, photos, and video at http://www.middlebury.edu/newsroom/archive/2017-news/node/551607. 2017 Bread Loaf faculty and course titles are now available. Full course descriptions will be posted online in mid-December. Read the 2016 Bread Loaf Journal of Student Writings online here. Please see our full commencement coverage, with photos and video, here. The Middlebury Bread Loaf School of English is pleased to announce that it will waive the application fee and $400 deposit for all students who apply to the New Mexico campus from now until the admissions season closes on Friday, May 13, 2016. With an exceptional student-faculty ratio of approximately 7:1, Bread Loaf’s New Mexico campus at St. John’s College in Santa Fe enrolls 70-80 students each summer. Enjoy Bread Loaf’s rigorous curriculum, eminent faculty, and community of engaged teachers and learners in an intimate Southwestern atmosphere. There is currently extensive course availability, abundant financial aid, and plenty of time to apply. Start your Bread Loaf application today at http://www.middlebury.edu/blse/admissions/apply/onlineapp. The Middlebury Bread Loaf School of English is mourning the loss of beloved faculty member Michael Armstrong. A member of the Bread Loaf community since 1986, he died at his home in Southampton, U.K. on March 7, 2016. Full multi-media coverage of the 2015 Bread Loaf/Vermont commencement is now available here. We are pleased to share here the 2015 Bread Loaf Journal of student writings. This year, we had over 100 excellent submissions. Thank you to everyone who contributed. Director Emily Bartels will be hosting the 3rd Annual Bread Loaf Celebration at her home in Princeton, New Jersey on Saturday, October 18th from 5-7 p.m. All students, faculty, and staff – past and present – are welcome. Please RSVP at middevents@middlebury.edu or 802.443.6000. A caveat from the Director, whose house is currently undergoing renovation: “The house is a wreck but the garden is beautiful!” Hope for sun. 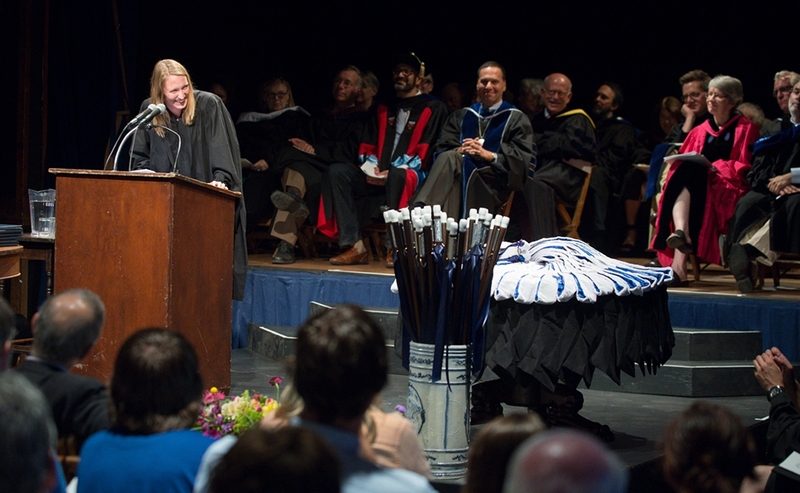 Bread Loaf School of English Director Emily Bartels opened the school’s 95th Commencement exercises on August 9 with words of gratitude for the graduates: “Thank you for helping us see better and think differently.” This culmination of years of academic work and collaboration, Bartels observed, was also a celebration of the Class of 2014’s ongoing connection to Bread Loaf. - Read the full story here. The 2014 edition of The Bread Loaf Journal: Writings from the School of English is available now online. We hope you enjoy this year's collection of student poems, fiction, nonfiction and critical writing. Winners of the annual Bread Loaf Fiction and Robert Haiduke Poetry prizes have now been named. Sally Yazwinski, a fourth-year Bread Loafer, won the fiction prize for her story, Sounds of a Snow Storm. Catherine Shubert won first prize in the poetry competition for her piece entitled "Bipolar." Ryan Tyree earned second prize for his poem "Friends," and Sarah Getchell honorable mention for "For You." Bread Loaf is delighted to announce that Dana Olsen, who joined the Bread Loaf staff in 2011, is our new Director of Admissions, following the retirement of Sandy LeGault from that position. This summer at the Vermont campus, Bread Loaf will host a number of speakers and lecturers, including faculty and guest authors. These events are open to the public. Arthur Walton Litz, Jr., Bread Loaf professor from the early 1970s through the early 1990s and a literary historian and critic who served as professor of English literature at Princeton University from 1956 to 1993, died on June 4, 2014, at University Medical Center of Princeton in New Jersey. After 32 years of learning, living, and working at Bread Loaf, Director of Admissions Sandy LeGault MA ’87 has left Bread Loaf to accept a new position in the President’s office at Middlebury College, where she will work, in part, on the search for the 17th president of the college. Middlebury College is now offering a number of special scholarships to support the summer study at the Bread Loaf School of English of current Middlebury undergraduates and those who have recently received a Middlebury bachelor’s degree. Robert Sullivan, best-selling author of Rats, The Meadowlands, A Whale Hunt, The Thoreau You Don’t Know, and My American Revolution, will be teaching a course on creative non-fiction at the Bread Loaf/Vermont campus this summer. He is also a contributing editor to Vogue and regularly writes for The New Yorker, The New York Times Magazine, New York magazine and others. Called an “urban Thoreau,” Sullivan is redefining rural and urban spaces by asking what and where nature is. Author of Annie John, A Small Place, Lucy, The Autobiography of My Mother, Talk Stories, Mr. Potter, and See Now Then; staff writer for The New Yorker for twenty years; Professor of Literature at Claremont McKenna College; winner of the Guggenheim Award for Fiction – JAMAICA KINCAID – will be the 2014 Elizabeth Drew Lecturer at the Bread Loaf/Vermont campus. The first-ever copy of The Bread Loaf Journal: Writings from the School of English, is now available online. Edited by graduates of the class of 2013 Simon Phillip Brown and John Milton Oliver, the collection includes poetry, short works of fiction & nonfiction, as well as a critical essay on Hamlet. The Bread Loaf School of English awarded 85 M.A.s, one M.Litt., and one B.A. this summer at its four campuses. Tom McKenna (MA '96: BLTN member), has been named a Teaching Ambassador by the US Department of Education for 2013-14, one of only about 40 such ambassadors named since 2011. As part of the Arthur Vining Davis Foundation grant supporting Bread Loaf’s efforts to expand the work and reach of BLTN, leading experts on digital literacy will offer workshops at each of the U.S. campuses this summer. The initiative brings insight, guidance, and advice to teachers at a time of rapid change in approaches to the teaching of literacy and communication. Bill McKibben, environmental activist, author, founder of 350.org, and Schumann Distinguished Scholar in the Environmental Studies Department at Middlebury College, will speak at Bread Loaf's Vermont campus this summer. This summer the Bread Loaf/Asheville campus will be home to writer-in-residence Rick Chess, author of three books of poetry and the Roy Carroll Professor of Honors Arts and Sciences and Professor of Literature and Language at University of North Carolina at Asheville. of all the living things in this place?" Students looking to supplement their daily Bread Loaf nourishment at Santa Fe will be delighted to learn that poet Simon Ortiz, photographer Lee Marmon, and professor Michael Katz are scheduled to speak at the campus this summer. Ever wonder what happens at Bread Loaf when you're not looking? When the snow flies, cross-country skiers head to the Bread Loaf campus to enjoy over fifty kilometers of trails at the Rikert Nordic Center. Take a moment to observe the transformation of Bread Loaf/Vermont's beloved summer home into a whirl of winter activity. Bread Loaf faculty member, poetry editor at The New Yorker, and Pulitzer Prize-winning poet Paul Muldoon was commissioned by Yahoo News to compose a poem on the occasion of Obama's second inauguration. Martín Espada, called "the Latino poet of his generation," will give a reading of his work at the Bread Loaf/Vermont campus this summer. A grant supporting Bread Loaf's efforts to expand the work and reach of the Bread Loaf Teacher Network as it enhances the delivery of secondary school education includes funding for writing, literacy, and digital communications workshops for students and teachers. A hearty group of Bread Loafers caught up with old friends at the NCTE convention in Las Vegas in November. Associate director Django Paris hosted the annual Bread Loaf gathering at the MGM Grand in Las Vegas. A small but spirited group of Bread Loaf students, alumni, and faculty got together at Bread Loaf director Emily Bartels's home in Princeton, New Jersey, on Saturday, October 13. A grand time was had by all. Access past news items here. We now have an official Facebook page, to join several unofficial pages that Bread Loaf students at the four campuses have created over the past few years. Hope to see you there!